News has broken out about the sale of THQ's assets and it looks like many of the defunct publisher's signature franchises have been acquired. But, surprisingly, some seemingly bankable properties haven't been snatched up. Many of the titles mentioned in a previously published assets list were sold off today. Most conspicuously, WWE isn't mentioned in the list of sold-off franchises mentioned in an official goodbye letter from earlier today. The pro wrestling license was the source of annually released games, which ranked among THQ's top earners for years. Another installment of the WWE franchise was said to be in development, presumably due to hit shelves later this year. But so far, no suitors for the video game slice of Vince McMahon's empire have emerged. Vigil Studios, the wholly owned dev group of the two Darksiders games, also hasn't found a home yet. The future for any further Darksiders games was nebulous and updates to the dev team's work on the Warhammer franchise were unclear as of a month ago. What The Hell Is Going On With Warhammer: 40,000: Dark Millenium? Add the Red Faction franchise to those two entities too. While Dead Island publisher Deep Silver has acquired Volition and that dev studio's beloved Saint's Row series, it's still unknown where Red Faction—also created by Volition—will wind up. 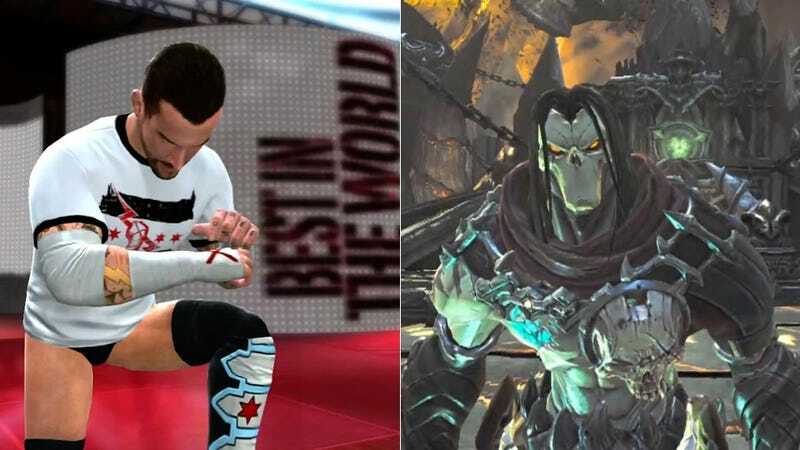 That seems to hint that THQ may yet find companies willing to take on the WWE franchise and Vigil. Kotaku has reached out to WWE representatives for comment and will update this story if we hear back.